Thortos Mobile Mechanic is commited to providing excellent customer service and quality services at affordable prices. With only honest qualified mechanics working on your car, why would you take your car anywhere else. Got a question for our Tweed Coast Mobile Mechanic? Worried there’s something wrong with your car? We pride ourselves on our honest, reliable service, with only qualified mechanics working on your car. If you’ve got a question we haven’t answered, please get in touch. Cars are just like us; they need to be looked after to keep you, your family and others safe on the road. We only use quality, market leading brake parts and can look after all brake repairs. Anything from brake pads and rotors changed; right up to full brake calliper rebuilds and upgrades. Are you getting what you paid for? Pre-purchase inspections are often overlooked but they are a must when buying a new car! Our pre-purchase inspection includes a full safety and condition check by expert mechanics, giving you peace of mind that you’re buying a quality car at the right price. The cost is $150 for passenger cars and some commercial vehicles; and $180 for 4WDs. A small price to pay that could save you thousands. The inspection takes between 1-2 hrs depending on the type of car. We understand that cost is very important when it comes to repairs and servicing. Some repairs are expensive but we keep our prices as low as possible. (1) No hidden costs. Just pay for your service and repairs with no surprises. (2) No fix, no charge. If we can’t fix your repairs, we don’t charge you. (3) Free quotes. You never save money putting repairs off – it only makes problems worse. Give us a call today for your free quote. Our Tweed Coast Mobile Mechanic is fitted with brand new, computerised diagnostic equipment which means we can service any new car to the highest standard – all in a mobile service. Plan to fix the car yourself, but want our expert opinion before you start work? We are happy to give you a diagnosis. In this case, we just charge a fixed fee of $99/hr for our time, expertise and fuel. Up to 75% of all repairs can be done on the spot by our mobile team. Tweed Coast Mobile Mechanic charges a flat rate of $99/hr + parts. Our mechanics bring everything they need to do all servicing and repairs at your home or work, including all protective and safety gear to ensure we leave your place as we found it. If the job cannot be done by our mobile service we can simply organise a time to pick your car up and drop it off a time and place that suits you. Need your car for work, study or family? We all do. Our same day diagnoses and repair is cost effective and comes with a guaranteed high standard of workman ship and quality approved parts. Mobile car servicing starts at $160 for most passenger and commercial vehicles. 4WDs start at $190. Price may vary depending on the type of your car but just ask and we’ll let you know first. Basic car servicing takes roughly an hour to complete. Our Tweed Coast Mobile Mechanic can replace anything from a broken bush, leaking shock absorber right up to suspension upgrades and lift kits for your 4x4. We use quality, market leading suspension brands such as Monroe, KYB and Nolathane. We can take care of all your log book servicing and repairs. You don’t have to use the dealer. We look after everything to manufacturer specifications and ensure we use approved parts that won’t void your new car warranty. We guarantee all our work. A damaged windscreen isn’t just annoying; it is dangerous and can severely affect your view of the road. It will also likely get your car rejected at your next safety check. We can complete windscreen repairs and replacements. Just ask us for a quote. All the latest petrol engines use EFI systems with a lot of components. When something goes wrong, you need a professional to fix the issue asap before any more damage occurs. We’re experts in diagnosing problems with spark plugs, ignition leads and fuel injectors – everything can be sorted using our high tech diagnostic equipment in a mobile service, just ask us for a quote. Our Tweed Coast Mobile Mechanic service can look after all types of fleet vehicles at your convenience. From 2+ car small fleets to company fleets of 100+ vehicles – we service all vehicles on site, saving you time and money travelling to and from the workshop. We service all areas on the Tweed and Coolangatta, south to Murwillumbah and Pottsville – saving you time by coming to you. Just contact our Tweed Coast Mobile Mechanic to let us know what you need. Larger jobs may need our workshop in Tweed Heads. We can even take your vehicle to the workshop, finish the repair and drop it back to you. Keep your warranty intact with our scheduled log book servicing. We have all the tools and products required to service your car to manufacturers’ standards. There’s no need to skip a service because you can’t find time to take your car in – our Tweed Coast Mobile Mechanic comes to you. Using our log book service will not void your warranty. In fact, we help you keep it valid by removing any hassles so you can maintain up-to-date servicing models to approved manufacturers’ standard. Contact us and we’ll get it done. Check out Thortos Mobile Mechanic on Facebook to see what our customers say about us. Thortos Mobile Mechanic is the Tweed Heads mechanic that comes to you. We’re here to save you time, money and hassle on all your vehicle servicing and repairs. Book a mobile mechanic today to visit you at home or work. 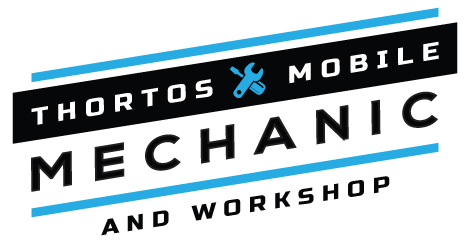 With more than 20 years combined experienced, the friendly Thortos Mobile Mechanic team is committed to providing honest, reliable service by highly qualified mechanics. We tell it like it is and provide service you can trust.